TRAVERSE CITY, Mich. — Sen. Wayne Schmidt, R-Traverse City, joined area residents and racers from all over the United States and Canada last weekend at the annual Sault Ste. Marie International 500 snowmobile race. This year marked the 50th anniversary of the I-500. Editor’s note: Print-quality versions of the photographs are available by clicking on the images or by visiting SenatorWayneSchmidt.com/photowire. 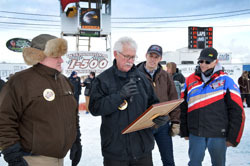 Photo caption: Sen. Wayne Schmidt, R-Traverse City, Rep. Lee Chatfield, R-Levering and chairman and spokesman for the I-500 Ric Federau look on as Sen. Darwin Booher, R-Evart, reads a tribute prepared by the legislators recognizing the importance of the I-500 to Northern Michigan. 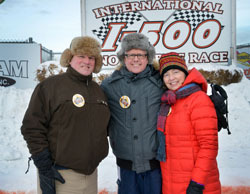 Photo caption: Sen. Wayne Schmidt, R-Traverse City, stops for a photo with Lake Superior State University Interim President Peter Mitchell and his wife Rebecca during the I-500 events leading up to the main race.